These words of determined rebellion were the impetus for the drafting of the Declaration of Independence. Between June 7th and July 1st, a debate in our Continental Congress ensued and a committee was appointed to present our case for independence to the world. Members of the Committee included John Adams of Massachusetts, Roger Sherman of Connecticut, Benjamin Franklin of Pennsylvania, Robert R. Livingston of New York and Thomas Jefferson of Virginia. Ultimately, the task of drafting the actual document rested with Thomas Jefferson. The Continental Congress reconvened on July 1st to consider the Lee resolution. The next day, a vote for independence was affirmed by 12 of the 13 clones and adopted. Revisions were required and the document was amended with minor changes, leaving the original spirit of the document in tact. 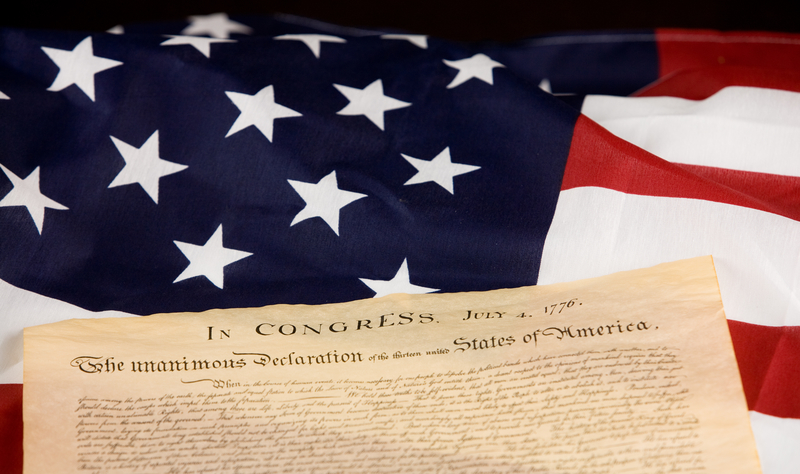 Late in the afternoon on July 4th, the declaration was adopted by a majority in the Congress. History tells us that John Hancock signed his name to the document with great flourish to ensure that King George could read it without his spectacles. The following day, copies of the Declaration of Independence were distributed, and on July 6, The Pennsylvania Evening Post became the first newspaper to print the extraordinary document. The Declaration of Independence has since become our nation’s most cherished symbol of liberty. For 15 or 20 years after the Declaration was written, people didn’t celebrate it much. By the 1790s, a time of bitter partisan conflicts, the Declaration had become controversial. After the War of 1812, the Federalist party began to come apart and the new parties of the 1820s and 1830s all considered themselves inheritors of Jefferson and the Democratic-Republicans. Printed copies of the Declaration began to circulate again, all with the date July 4, 1776, listed at the top. The post Celebrating the Declaration of Independence appeared first on Shmula.